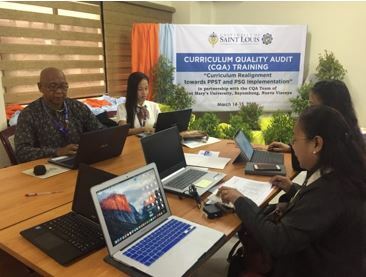 The Curriculum Quality Audit (CQA) Teacher Education team of Saint Mary’s University, Bayombong, Nueva Vizcaya, partnered with the University of Saint Louis (USL) for a cascading program of their CQA Training organized by the Philippine National Research Center for Teacher Quality (RCTQ) with support from the Australian Government. CQA trainers from SMU, namely: Dr. Ma. Teresa B. Tayaban, dean of the School of Teacher Education and Humanities; Dr. Liberty Afan-Rosario, Elementary Education Program chair; and Dr. John G. Tayaban, head of SMU’s Publishing Office, conducted the training on March 14-15, 2019 at the N7 Meeting Room, Saint Lorenzo Building of the University. The two-day training participants were some USL administrators, program chairs, and selected teachers from the School of Education, Arts, Sciences and Health (SEASH). The participants were tasked to participate in a systematized curriculum quality audit process; understand standards set in the Philippine Professional Standards for Teachers (PPST); and apply heat maps, inter-coder reliability, decision logs, and basic and differentiated audit. The trainees applied the CQA process through review of existing syllabi, course content, and course learning outcomes, and how those support PPST implementation. The President stressed that developments in Science and Technology, evolving standards expected from graduates and teachers, and the current state of Philippine Education challenge administrators and teachers to remain prudent and responsive to merge classic practices and new practices in education. With Curriculum Quality Audit and with commitment to outcome-based education, the USL Teacher Education program is expected to continuously evaluate how its curriculum enables graduates to attain the competencies expected from beginning teachers. It was noted during the training that the PPST may also be used as a reference for USL to evaluate its existing faculty evaluation tools. The principles and processes of CQA for Teacher Education program were developed by a project team that consists of specialists from the University of New England – SiMERR National Research Center; Philippine National Research Center for Teacher Quality (RCTQ); Philippine Normal University (PNU); and the Philippine Basic Education Sector Transformation (BEST) which is supported by the Australian Government.